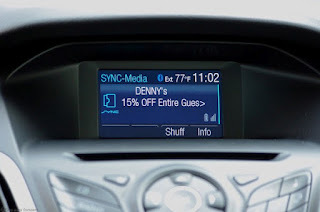 BRIGHTON, Mich.- If you're familiar with Ford SYNC, you already know the value of its convenience and how it can help keep you connected while you drive. It's time to make your experience even more enjoyable! Ford has launched a partnership with ROXIMITY, the latest app to join to in-car infotainment system. Roximity with Ford SYNC is a location based deal provider that will alert you of local deals based on your location and the time of day. Download the Roximity app on any smartphone and then input your individual preferences and interests so that you only receive deals for things you are actually interested in, unlike other deal sites like Groupon and Living Social! Plus these deals are current based on your location. Connect your phone with Ford SYNC and Roximity becomes available through the in-car system. Take advantage of our Ford Escape Rebates and Ford Fusion Rebates to get in a Ford and start using Roximity with SYNC today!Your Ford Dealership Serving Novi, MI is located at 8240 Grand River Ave. just north of I-96 in Brighton. We are a family owned and operated business that strives on customer satisfaction. For more information on Brighton Ford visit BrightonFord.com or give us a call at (800)-836-8206.